Darn it all! Sometimes you just can't win! Now I know how all the dedicated Bigfoot researchers feel after years in the Oregon woods, finally snapping a photograph of their prey that will prove its existence to the world—only for the photo to turn out too blurry to present in a peer-reviewed paper on Entertainment Tonight. Or the UFO researcher, an entire lifetime spent traveling to that mountaintop near Area 51 where Grays routinely come in their UFOs to interview abduction candidates and provide them with the upcoming history of the world while taking them on a quick ride to the Pleides to meet their uncle, only to have the picture spoiled by a Frisbee thrown at the last minute by one of the CIA agents dressed in a Chewbacca outfit in order to impede truthseeking. Happens all the time. Come on. You've all seen those plumes of smoke coming off airplanes? The government wants you think they're just vapor trails. Everyone who knows the truth—that they're actually autism viruses designed to make the population compliant (and which sometimes yield unexpected results, like making people take Donald Trump seriously)—all those people now reside in a FEMA camp in the Bronx, which is close to Bill Clinton's Harlem office so he can keep an eye on things, and which is guarded by trained chupacabras, the same bloodthirsty animal employed by the Clintons to keep MSNBC from ever mentioning Bernie Sanders. 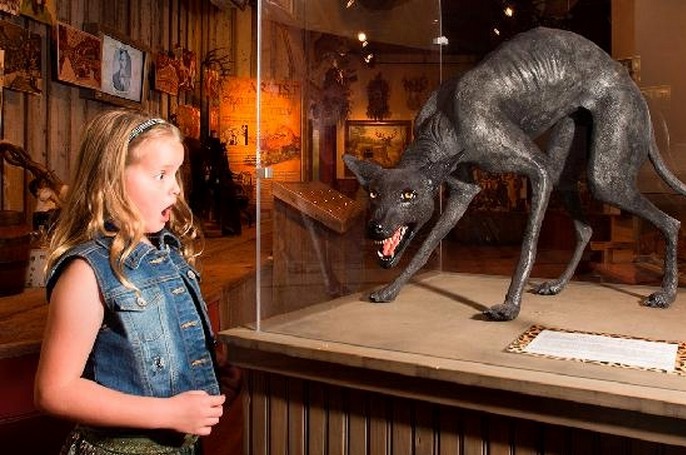 Another rare chupacabra, in the care of scientists who happen to own a Texas bar. And so, imagine how I felt when the above image of a Chupacabra—the legendary, razor-toothed fiend whose name translates to goat sucker, for the wanton manner in which they consume the blood of prey—came back from the 1-Hour Photomat so badly out of focus. As a result, some people will claim that this is not a chupacabra at all, or some kind of set up. Or a dog or who knows what nonsense. Oh, I can hear the whinging all the way up here in Maine. All I can say is I was there, and you weren't. If this image isn't a chupacabra, what are you going to tell me next? That it's Roo or something? Furthermore, if you don't want to take my word for it, take that of an esteemed wildlife scientist: Johnny Depp. He was brutally attacked by a chupacabra and had to fight it for two hours in a high-rise hotel room until he finally managed to fling it off the 23rd floor balcony onto the Tokyo streets below. You think any of the paparazzi—and they're professional photographers—managed to get a clean shot of the chupa? I rest my case.